Imagine that you’re looking at a painting of a wedding party. It all looks lovely, soft-focus and an obviously joyous occasion. Then the author passes you high definition spectacles and suddenly it’s all in sharp focus. 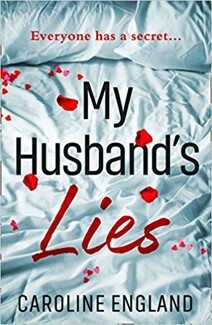 This is what Caroline England achieves in ‘My Husband’s Lies’. She wastes no time in shattering your pre-conceptions, leaving you in what appears like ‘Four Weddings and a Funeral’, but with cinematography by Hieronymus Bosch. Nick and Lisa are the happy couple, only Nick has a secret in his past that’s about to catch up to him. Lisa wants a baby now, but hasn’t got Nick to buy into the idea. Geri is married to Dan and they’re expecting their first child. But why is Will’s brother, Sebastian, looking so longingly at Dan? What do Will’s glances at Jen mean when she’s married to reliable husband Ian? And why is Will’s wife, Penny, looking like she might jump from a bedroom window? This is a deliciously dark and tangled tale of honesty as a fluid concept, burdensome and consuming lies, lust and deeply hidden truths. The characters, whilst not always sympathetic, are well fleshed-out and believable. The twists in the plot are convincing, in some cases well-disguised and surprising. A worthy follow on to ‘Beneath the Skin’. Now, you have a secret don’t you? You’ll feel better if you get it off your chest. You can tell me...can’t you?